If you’re new to cloth diapering, you may be a bit worried about how you’re going to have to wash the diapers. I know I was – I was actually a little freaked out because some well meaning moms made it sound really awful. 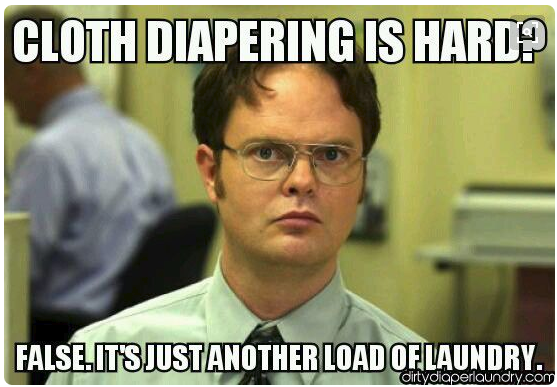 “Cloth diapering is great, but you’ve got your work cut out for you because washing cloth diapers is not fun”. Thankfully, they were wrong. In comparison to washing other laundry, washing cloth diapers takes a little more work. For one thing, unlike regular laundry, you cannot use fabric softeners. However, washing cloth diapers is not hard at all, so don’t let your concerns about cloth diapers deter you from starting your journey. Once you have the hang of it and you’ve developed a routine, it’s as easy as pie. Remove poop from your cloth diapers by dumping it or using a diaper sprayer to get the solids into the toilet. Throw your soiled diapers into a cloth diaper pail or wet bag until you are ready to wash. To keep the smell and bacteria growth down as much as possible, try to get into a routine of washing cloth diapers every day or two. On wash day, throw your soiled diapers in the washing machine – wash 12-18 diapers at a time. This is the optimum load size to get as many diapers at once as clean as possible. Pre-rinse without detergent, using your washer’s highest water setting. Add the recommended amount of detergent. Never add fabric softeners to your cloth diaper loads; softeners build up on cloth, and will stop your diapers from absorbing baby’s mess. Wash in a regular hot water cycle with an extra rinse cycle. 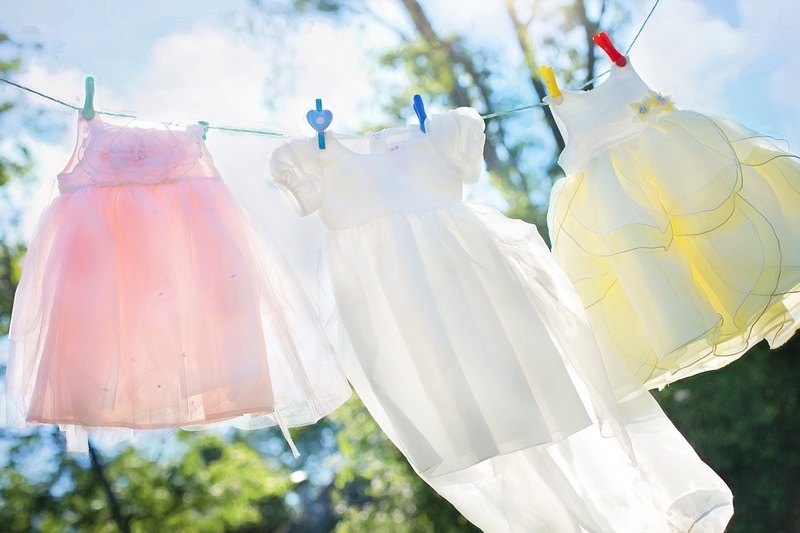 Run your cloth diapers through the dryer, or hang them to dry in the sun for extra stain-fighting power. Cloth diapers from well-known baby care companies always come with a care guide. It will tell you exactly how to wash your diapers, and whether the fabric can safely be run through the washer. Be sure to read the care instructions before you wash or even store your diapers. Some fancy diaper covers (like crochet diaper covers), are very fragile and could be damaged easily. They may require hand-washing. If you are concerned about warranties, follow the care instructions with your cloth diapers, or you will likely void the warranty. 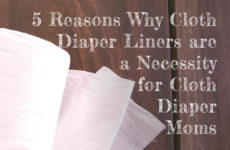 This is probably the most important thing you will want to do because if cloth diapers sit in a cloth diaper pail or wet bag for more than 3 days, they will start to grow bacteria and develop that dreaded ammonia smell. Your best bet is to simply get into a routine of washing them every 1-3 days. How often you need to wash your diapers also depend on your baby’s age and how many cloth diapers you have. Prewash all of your soiled diapers before adding any detergent or soap to the load. Prewashing your diapers ensures that they are 100% germ free. Detergent is a sensitive subject in cloth diaper circles. Many moms believe you should use half the recommended detergent to wash your cloth diapers, or the detergent will “build up” on the diapers and cut absorbency. Detergent build-up is valid but if you don’t use enough detergent, your cloth diapers will not get properly clean, and that could cause the spread of germs – remember, you’re washing poop out of these things! If you’re concerned about detergent build-up, always give your diapers an extra rinse. Which detergent to use on your cloth diapers is another sensitive matter. Many moms swear by Tide, since it’s a mainstream brand, cost-effective and thoroughly cleans diapers, while others spend the extra money and go with expensive cloth diaper detergents. Most cloth diaper moms recommend a short cold-water prewash without detergent, using hot water for the thorough wash cycle. Hot water is guaranteed to kill any bacteria that are lingering after the prewash, so you should always wash your cloth diapers in hot water (again, you’re washing poop off of them). If the dreaded ammonia stink builds up on your cloth diapers, don’t panic. Nothing is wrong with your baby. The mere fact that I’m mentioning it here, is evidence that it is common. but you do need to treat it. Your diapers will stink of ammonia, most commonly, you leave them to sit unwashed for too long. Bacteria convert baby’s urine into ammonia if it’s allowed to sit too long, and that’s when you get that smell. Untreated ammonia in cloth diapers can cause chemical burns or rashes on baby’s bottom. To clear out ammonia stink, a few hot water and detergent washes and extra rinses may do the trick. If the smell still lingers after that, you may want to strip the diapers. Wash between 12-18 diapers at a time. A bigger load than that will not effectively clean your cloth diapers. If the load is too small, add a towel to trick the washing machine into adding more water and get a properly clean wash going. If you have a small stash of cloth diapers, you will likely every day or two. This means your diapers will go this isn’t a major problem, but it may wear out your cloth diapers and diaper covers faster. For example, the elastic or Velcro may not work as well as a diaper cover hasn’t been washed as frequently. 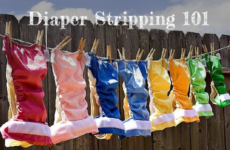 If you are only planning to cloth diaper one child, this is probably no big deal, but if you are hoping to use the same stash for more children, you might want to consider increasing your stash to reduce the wear and tear on them. These are GREAT. Whether you buy a cloth diaper pail or make your own, your the diapers will need a place to live until wash day. Having a diaper pail prevents diaper odors from spreading throughout the house. Some moms recommend a laundry hamper with holes in the side to keep it ventilated, but if you wash your cloth diapers every other day, that off day can stink up the whole house. Yes, the diaper container stinky when you open it but I usually just hold my breath for the 10-20 seconds it takes me to dump the load into the washing machine, turn the pail liner or wet bag inside out and dump that in as well. Wet bags are especially convenient when you need to change baby’s cloth diaper on the go, but they can be used in the house too. Any waterproof bag with a zipper will do the trick, but you can buy baby-specific wet bags in different sizes and designs. They will happily hold your soiled diapers and contain bad smells until wash day. Bleach is a bad word for some, especially when it comes to cloth diapers; in fact, using bleach voids the warranty on some brands of cloth diapers. Check care label before you grab the bleach. However, you can safely bleach many inserts, prefolds and flat diapers, and many parents want the ability to bleach when they need to fight diaper stains. If you do decide to bleach, only bleach the inserts and diapers – bleach will likely ruin your diaper covers. If you choose to bleach your cloth diapers, it will likely ruin them. Having said that, also be aware that bleach will likely increase the wear and lessen the durability of our diapers. If you bleach, run your diapers and inserts through an extra rinse after you have bleached them to ensure that no bleach is left in your diapers. Bleach left in diapers can cause rashes on baby’s bottom. Despite using cloth diaper liners and washing baby’s poop off your diapers right away, chances are really good that they will get stained. Bamboo charcoal inserts like our Baby Tooshy Bamboo Diapers that do not show stains. The sun is probably the best stain treatment. If the stain hasn’t set into the diaper yet, you can leave the “affected” diaper to dry in the sun for a few hours after washing. If the stain persists, you may want to try one more time; add a few squirts of lemon juice before returning it to the sun. Wash again and hopefully the stain is gone. This option may not be open to you don’t get much sun where you live. Some moms swear by an overnight soak in hot water and Oxiclean, or a similar stain-fighting presoaker oxiclean. If all else fails, your diaper’s care labels allow it, and you’re willing to try it, there’s bleach.. If you’re using insertsinserts, prefolds or flat diapers in a pocket or diaper cover, separate them before washing. This small but important step ensures you won’t forget to remove the inner layers from the pocket or cover after prewashing, and helps make sure everything gets clean. Adding fabric softener to cloth diapers leaves a layer of residue behind, which may make them less absorbent. 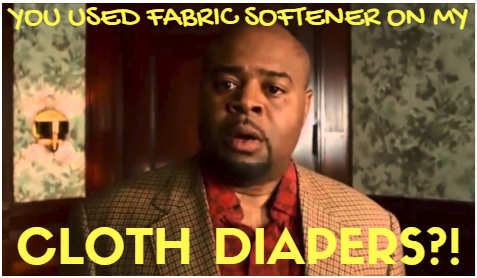 If you do slip up and add fabric softener to your cloth diaper load, it’s not the end of the world. A few extra hot washes without detergent may be enough to fix the problem. If you find that your diapers are still not absorbing as well as they did before, you can strip them. Some cloth diaper liners come in a roll, like the Baby Tooshy Cloth Diaper Liners. You simply pull off a piece, and lay it on top of your cloth diaper. Liners are not there to add absorbency, but rather to catch baby’s poop – urine will run through them. At diaper cleaning time, you pick up the liner by the edges, and drop the poop into the toilet. It’s very simple. Before investing in liners, make sure they are flushable (and whether your sewer or septic system can handle anything beyond toilet paper being flushed), and look for durable liners that stay where you put them. Some liners shift around the diaper as baby moves, which means they’re not in a good place to catch poop when they need to do their job. Baby poop will often fall right off the diaper or liner into the toilet, but if it’s stuck to the diaper, a diaper sprayer attached to your toilet will be your best friend. It attaches to your toilet. You can buy one from Amazon or other retailers, and adding them to your toilet is easy. All you need to do is hold the soiled diaper low into the toilet bowl, and spray off the poop downward the toilet. You could simply hold your diaper in one hand and the diaper sprayer in the other, but a splatter shield makes the whole process easier by cutting the risk of water or poop getting everywhere. If you don’t have a diaper sprayer, you may be able to just run soiled diapers under the sink or bathtub faucet after you plop the excess poop into the toilet. You really don’t have to use your hands or a scrubber if you don’t want to—just holding it under an open tap with good water pressure works wonders. Make sure diapers are completely dry before you use them on your baby. Read the instructions on your diapers clearly to preserve the diaper’s absorbency and elasticity as long as possible. For some diapers, you should only machine dry the inner absorbent layer,to preserve the diaper’s absorbency and elasticity as long as possible. For some diapers, you should only machine dry and and air dry the cloth diaper cover. Use low heat settings to machine dry your baby’s whole diaper. Higher temperatures could destroy the texture of the material, melt a diaper cover’s absorbent layer, and reduce its quality and elasticity immensely. Optionally, you can add woolen dryer balls to your diaper load to help them dry faster and eliminate static. Air dry your cloth diapers in the sun whenever you can. The best time to put the diapers out to dry is early morning or when it’s windy, which dries your diapers faster but helps to keep them soft. If this option is not available to you because of bad weather, you can dry them on a drying rack. If money is tight, check for local If money is tight, check for localaundromats that will help with your diaper laundry. Taking the time to find out if laundromats in your area can do this might save you a lot of trouble. Washing cloth diapers is not hard once you get the hang of it. 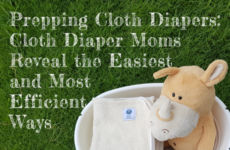 Yes, there are a few extra things to consider when you wash cloth diapers, compared to regular laundry, but, knowing how to wash cloth diapers properly will save you a lot of trouble in the long run. If you take only one thing from this article, I’d strongly recommend that you get into a routine. This will make a huge difference for you and will truly make your life easier. There’s a lot of diaper-washing advice out there, including this very post, and some of it is contradictory (like that myth about using half the recommended detergent to get your diapers clean); when in doubt, follow your parental instinct and do what seems best. 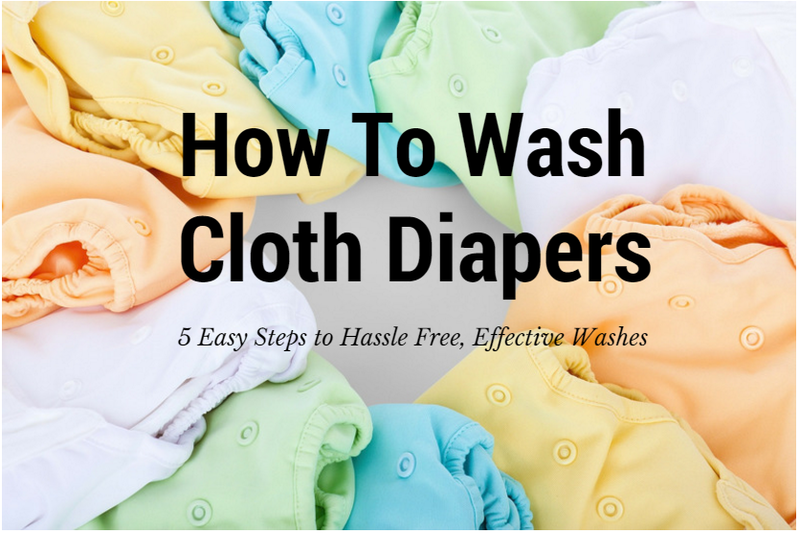 Washing cloth diapers is easy, but it's a little different from washing regular laundry. 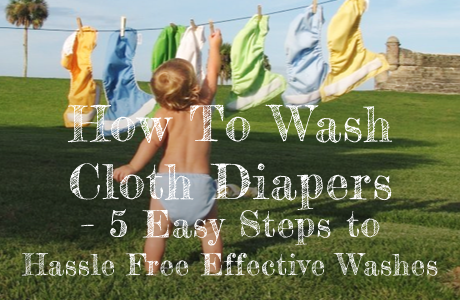 In this article, we show you step by step how to do it, and answer all cloth diaper washing related questions.